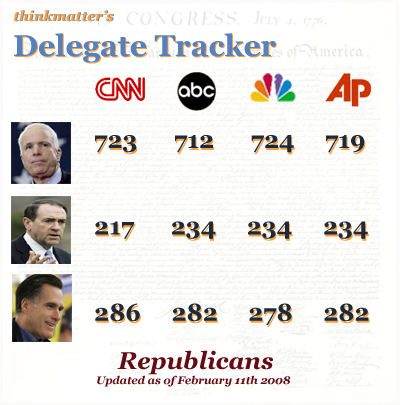 We are at a furious pace to update the 2008 horse race. Nearly everywhere you look, the media outlets are attempting to portray momentum for Obama and a Clinton sinking into despair. I don’t think that this is true just yet (and will have further posts describing why not) but for now, let’s look at the numbers. Clinton is coming off a bad weekend where she has tried to temper Obama’s momentum by claiming that his wins were expected in Louisiana, Nebraska and Washington. True or not, the Junior Senator from Illinois is closing the gap quickly, and may even take the lead when Virginia, Maryland and DC vote this Tuesday. 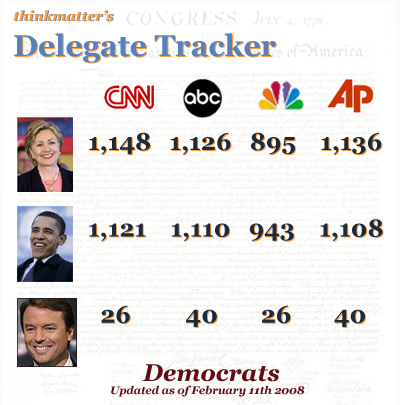 Clinton clearly has a Barack Problem and his late surge has her organization scrambling to stop him at the March 4th primaries in Ohio, Rhode Island, Texas and Vermont where 444 delegates are at stake. She can hope to split those counts with him and battle for the 188 remaining in Pennsylvania on April 22nd. I think we might see a spring equinox before we see an Democratic nominee. I’ve also moved Romney to the bottom rung in the GOP tracker given his drop-out status (and unbelievable robotic concession speech) from last week. This does not make Huckabee a threat to McCain, but quite simply a hold-out until McCain can eventually clean up the messy nomination process and focus his efforts on November. Lastly, I’m keeping Edwards and Romney on these lists only because they have not chosen to endorse anyone yet, and when they do decide to make their choices public, their delegate counts could give the recipient a boost. Huckabee stands to benefit the most in this situation, but if Edwards were to endorse Obama, both anectdotal endorsement and his delegate count could shoot Barack’s momentum into the stratosphere.